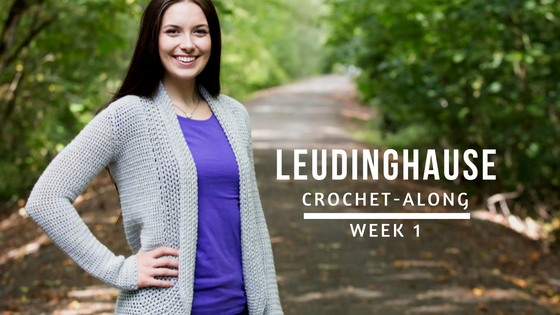 Welcome to Week 1 of the Leudinghause Crochet-Along! This week we will be checking our gauge. First of all. if you do not have all your yarn yet don’t worry! I made this first week short on purpose so you could catch up. Next, if you have NEVER made a gauge swatch before I’m here to help. I’ve made a complete video explaining the process. If you need more information be sure to watch the video above. Remember like I said in last week’s post, we are using a G/4mm Furls Odyssey Hook. Block your swatch. Because I’m using acrylic I just threw mine in the washing machine and dryer. If you are subbing with something else be sure to block accordingly. Why do I need to block my swatch? I explain in the video at 10:02. If you think you might like to try steam blocking I explain how to do that at 12:32 in the video. Measure your swatch! I show this at 14:57 in the video. If you got lucky and your gauge is correct celebrate because that RARELY happens on the first try! If it’s off you will need to start over with a new swatch. PLEASE don’t worry about using up your yarn. I always add a little extra just in case. Unless you’re making 10 swatches it shouldn’t be an issue. (17:25) If you have too many stitches in your 4″ your tension is too tight and you need to try with a larger hook. If you have too few stitches your tension is too loose and you need to try a smaller hook. If you are able to get the right number of stitches but your height is off please view THIS video where I give a few quick fixes that may help. Once you figure out what hook will work write it down somewhere so you don’t forget! Sit back. relax and I will see you next week!